This article is about the biscuit. For the pod vegetable, see Okra. 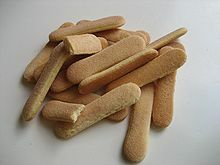 Ladyfingers, sometimes known by their original Italian name savoiardi,[a] or as sponge fingers in British English, are low density, dry, egg-based, sweet sponge biscuits roughly shaped like a large finger. They are a principal ingredient in many dessert recipes, such as trifles and charlottes, and are also used as fruit or chocolate gateau linings, and sometimes for the sponge element of tiramisu. They are typically soaked in a sugar syrup or liqueur, or in coffee or espresso for the dessert tiramisu. Plain ladyfingers are commonly given to infants, being soft enough for teething mouths, but easy to grasp and firm enough not to fall apart. Ladyfingers originated in the late 15th century at the court of the Duchy of Savoy and were created to mark the occasion of a visit by the King of France. Later they were given the name Savoiardi and recognized as an "official" court biscuit. They were particularly appreciated by the young members of the court and offered to visitors as a symbol of the local cuisine. In Mexico: soletas "little soles"
In South Africa: sold as "boudoir biscuits", but best known as "finger biscuits"
In the United Kingdom: "sponge-fingers", "boudoir biscuits", "baby biscuits", or "boudoir fingers"
In the United States: "ladyfingers"
Like other sponge cakes, ladyfingers traditionally contain no chemical leavening agent, and rely on air incorporated into the eggs for their "sponge" texture. However, some brands contain ammonium bicarbonate. The egg whites and egg yolks mixed with sugar are typically beaten separately and folded together with flour. They contain more flour than the average sponge cake. The mixture is piped through a pastry bag in short lines onto sheets, giving the biscuits their notable shape. Before baking, powdered sugar is usually sifted over the top to give a soft crust. The finished ladyfingers are usually layered into a dessert such as tiramisu or trifle. ^ a b c The Ultimate Cookie Book. Better Homes and Gardens Ultimate Series. Houghton Mifflin Harcourt Publishing Company. 2014. p. 169. ISBN 978-0-544-33929-3. Retrieved January 29, 2017. ^ Parkinson, A. (2005). Italian Desserts. A. Parkinson. p. 63. ISBN 978-1-4116-4464-9. Retrieved January 29, 2017. ^ Biszkopty (Polski) Carrefour. Poland. ^ Sinclair, Charles (1 January 2009). "Dictionary of Food: International Food and Cooking Terms from A to Z". A&C Black – via Google Books. This page was last edited on 31 March 2019, at 21:16 (UTC).